The 12th day of Christmas…didn’t you hear those 12 drummers do their thing? The day that the realization hit that Jesus was the Son of God…and was sent not only to love and save the Jewish people, but that God so-loved the world that Jesus came to be a prophet, priest, and king for all. 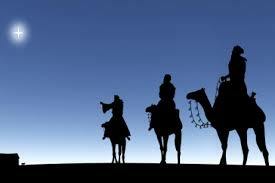 Epiphany in the original greek (Epiphaneia) means manifestation or striking appearance. This can mean the literal physical manifestation of a divine being (as in a theophany…like God appearing to Moses or Joshua). And it has come to more mean when a person has a moment of sudden revelation or insight. Upon learning of the significance of Epiphany a few years ago, I started leaving my Christmas decorations up until at LEAST January 6th (and usually until the weekend afterwards depending on what day the 6th lands on). Not only does this allow me to have the beauty of decorations and lights and candles and mistletoe into the first week of the new year (which is often filled to the brim with extra work and catching up and in need of some beauty), but it also gives me time to reflect on what it means to me to believe in a God who is willing to act in epiphanies. A God who likes surprises. A God who doesn’t act like we expect him to. A God that does not stay in the box that humanity tries to construct around him. A God who is willing to say “Bet you didn’t see that coming” with a shake of her head and a giggle. I had an epiphany…and it’s the same sudden realization that I have every year…I am so very loved and accepted by a God who wants to shower me with love, mercy, grace, hope, and good good things.